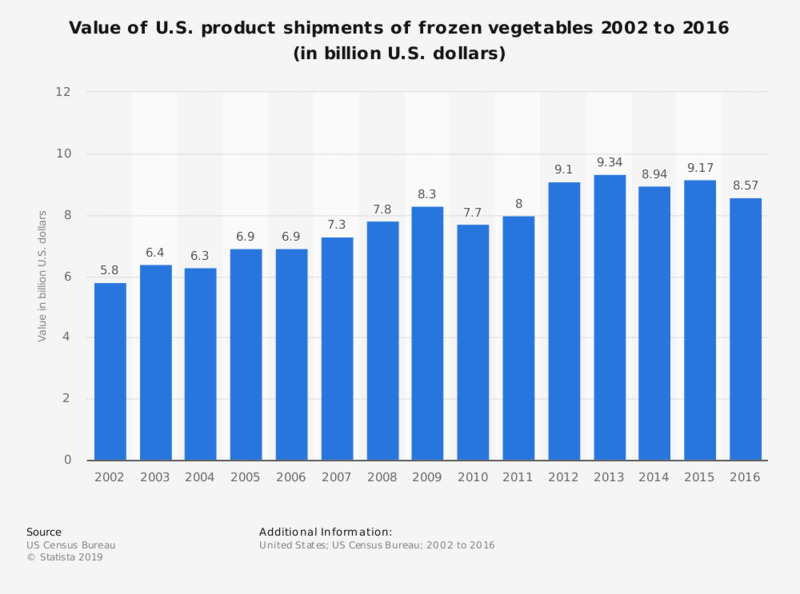 The timeline shows the value of U.S. product shipments of frozen vegetables from 2002 to 2016. In 2016, the value of U.S. product shipments of frozen vegetables amounted to 8.57 billion U.S. dollars. Data from 2002 to 2014 were taken from previous editions of the publication. U.S. population: How many packages of frozen vegetables (excluding potatoes) have you eaten in the last 30 days? U.S. population: How many packages of French's frozen vegetables have you eaten in the last 30 days? U.S. population: How many packages of Freshlike frozen vegetables have you eaten in the last 30 days? U.S. population: Which brands of frozen vegetables (excluding potatoes) do you eat most often?